If you dug a hole through the center of the earth, and jumped in, would you stay at the center because of gravity? | Why Do We Do It? No matter how confidently most of us can answer, “yes we would stay at the center because of gravity”, there is a little more at work here. Actually, this is what would happen, considering we have a hole through the Earth, and ignoring various factors, such as temperature, pressure, air resistance etc..
At first, we would hurtle downwards, but as we approach the center, the force of gravity would start to decrease, and eventually disappear completely. This so happens because, when we approach the center, the Earth pulls you in all direction and not just the center. Hence this leads to no gravity and hence no force at the center of the Earth. 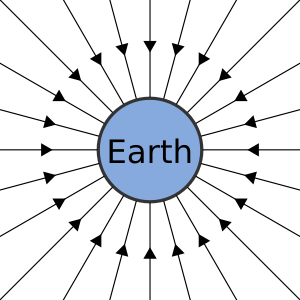 Now, when we approach the center, we would have accumulated enough velocity to be thrown in the opposite direction, with an increasing gravitational force pulling you back to the center (kinda like a jump, where you feel a force pulling you back down). You then get pulled back to the center and keep oscillating in a similar fashion, until you stop and stay still at the center of the Earth. So would we stay in the center of the Earth because of gravity, well Yes!! but one should also note, that there is “No Gravity” in the center itself. If we were to fall into the hole, how long before we reach the other side? This entry was posted on March 10, 2011 by Avi. It was filed under 2011, March and was tagged with Alternative, center of Earth, Drag (physics), Earth, fall, fall through center of earth, Free fall, Gravitation, Gravity of Earth, Inner core, no gravity center of earth, Physics.